For more than 50 years Nomura DS has designed and crafted precise, reliable Swiss-style turning machines. 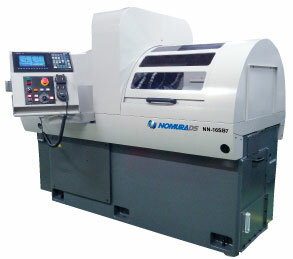 For more than 50 years NomuraDS has designed and crafted precise, reliable Swiss-style turning machines. NomuraDS Swiss-style turning machines are ideal for machining complex parts, working with difficult-to-machine materials, achieving fine surface finishes and reducing tool costs. High precision part capability with a variety of options. Compact and versatile Swiss-type automatic lathe with high performance capability. A series with a variety of options to handle complex parts. A series with standard machining capabilities and versatile configurations. Adaptable series to handle complex parts with increased productivity.